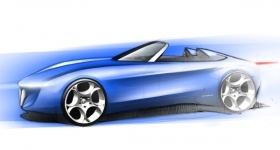 This rendering from Pininfarina shows its idea for a sleek two-seat Alfa Romeo. TURIN -- Italian design houses Bertone and Pininfarina S.p.A. each will unveil an Alfa Romeo concept car at the Geneva auto show in March. Pininfarina released a rendering of it two-seat model today. The still-unnamed concept will celebrate two anniversaries: 80 years for Pininfarina and a century for Alfa Romeo. Pininfarina currently builds Alfa Romeo's Brera coupe and Spider. Bertone will unveil a coupe that reports say will be based on the Alfa 8C Competizione limited-edition supercar. Both cars are prototypes and are not part of Alfa's current future model program. The Fiat S.p.A. subsidiary's future is under review. Alfa has lost between 200 million and 400 million euros a year during the last 10 years, sources say. Fiat is expected to present its new strategy for Alfa on April 21 as part of Fiat CEO Sergio Marchionne's 2010-2014 business plan for Italy’s largest industrial group.